Welcome to Reload Internet in Paddington, London! Do you need a suitable photograph for your Netherlands passport photo or Netherlands visa photo for your application (Dutch Passport Photo can be found here)? If you live in or near London, visit us today. 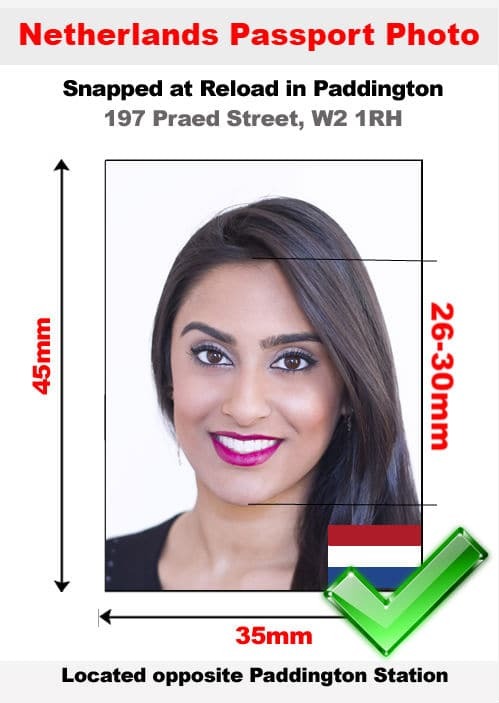 We can produce your Netherlands passport photo or visa photo set instantly in our store, any time of the day. We are open from early in the morning until late into the evening, every day of the week! No need for an appointment, just stop by the store and one of our experienced members of staff will assist you straight away. Our store has been in operation in Paddington for over a decade, producing hundreds of successful passport, visa and ID photographs every week. All of which come with a 100% guarantee to be accepted when submitted to your Embassy of choice along with your application. We have a team of trained photographers that know the ins and outs of every country’s passport and visa photo guidelines, and this is why we can guarantee that your photographs will be accepted the first time round. Why go anywhere else? 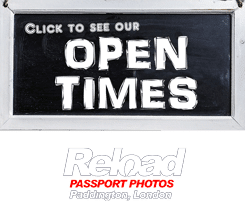 Visit Reload Internet in Paddington, London, today for your Netherlands passport photo or visa photo and you can be confident in the knowledge that it will pass without issue. When you get your Netherlands passport photo or visa photo from Reload Internet, we aim to produce your photographs within 10 minutes of your arrival at our store. We will capture your image with the correct background and lighting required by the Netherlands Embassy. After we have taken your photograph, we will always check with you to ensure you are satisfied with the photo. Once we have confirmed with you, we will cross-check the image with the official passport and visa photo guidelines to guarantee that it will pass first time with your application. Afterwards we will print out a set of photographs for you using embassy approved digital photo printers, and cut them to the exact sizing required. This level of service is why we can guarantee that your photographs will be accepted without issue, and for the low price of just £9.99, why visit anywhere else? Your Netherlands passport photo or visa photo must meet all of the necessary requirements listed below, if it does not then it is highly likely that your application will be rejected when you attempt to submit it to the Embassy due to a photo error. This can cost you excessive amounts of time, money and stress, which is why it is important to visit a reputable establishment for your photographs. Visit Reload Internet today! Your photographs must measure 45 x 35mm, with 65-75% of the photo being covered by the applicant’s face. The measurement from the bottom of the applicant’s chin to the top of their forehead should be between 26-30mm. The applicant must adopt a neutral facial expression, look straight at the camera, with the mouth closed. If you are wearing glasses, the lenses must be fully transparent, and there cannot be any distortion caused by reflection from the glasses. There should also not be any shadow on the applicant’s face. Headgear is not allowed, however exceptions can be made in the cases of religious, medical or cultural circumstances.